Welcome to the first instalment of #TwoMinuteTricks! I love a spot of arts and crafts at the weekend but don’t necessarily have as much time to spare as I would like so quick and easy craft sessions allow me to satisfy my handmade cravings without taking time I don’t have to spare. These flower pom poms are dead easy to make. 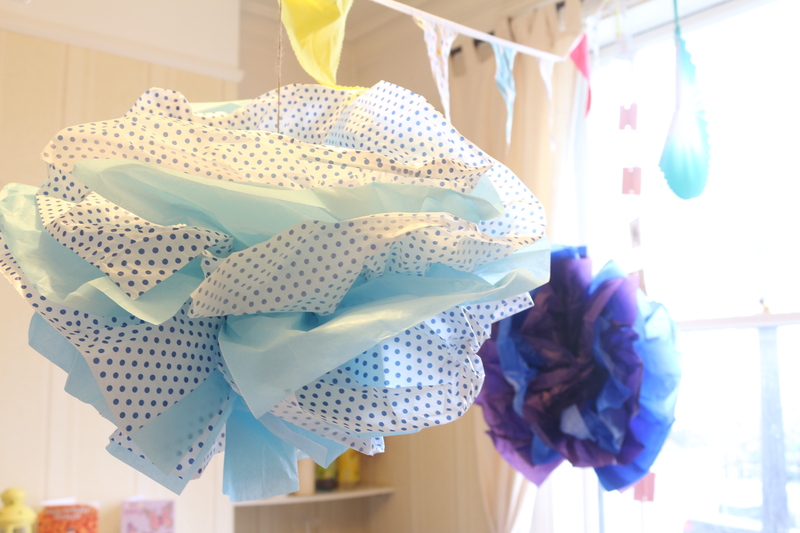 All you need to make your own are 10 sheets of tissue paper per pom pom, an elastic band, a pair of scissors, string and some imagination. This month I celebrated my birthday with a Mad Hatter’s Tea Party and made these decorations to spruce up our living room for the occasion. They’re a cheap way to add splashes of colour to your party and, if Pinterest is anything to go by, they’re a popular activity among crafty families and brides-to-be on a budget. I love them and the best thing about them is every one is different. You can play about with them and find your own style. I kept mine quite simple but you can easily increase the amount of tissue paper to add more petals or cut your paper in half – before you fold, of course – to make more delicate blooms.